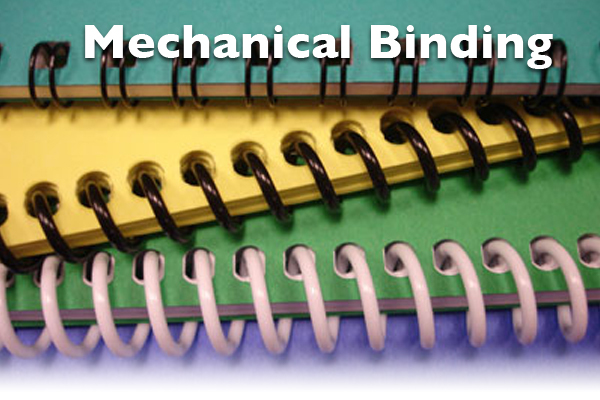 Mechanical Binding is an economical and attractive binding solution to create a book, manual, or marketing piece. Wire-O binding (also known as “double loop” binding) is produced using pre-formed wire loops that are bound in pairs down the spine of a book. Wire-O-bound books do more than just lay flat; they can be folded 360 degrees for single-hand use. Wire-O binding is attractive, sturdy and available in more than a dozen colors, including PMS matched tones. Like all mechanical binding styles, Wire-O binding can be produced with multiple stock weights and sizes. Design options such as foldouts, pockets, index tabs and die cuts can be easily incorporated. Semi- and fully-concealed cover options make Wire-O binding even more versatile and attractive. Plastic comb binding utilizes a hard “comb” binding element to hold pages together. Plastic comb-bound books will lay flat, and can include a wide range of design options. One advantage of plastic comb binding is that the spine can be printed for easy identification while on a shelf. Plastic spiral binding involves coiling a length of plastic binding material along the spine of a book. Like other mechanical binding styles, plastic spiral binding lays flat and is available in more than a dozen standard colors and PMS-matched tones.